Preheat the oven to fan 180oC/ conventional 200o C/gas 6. Take the fish fillets with the skin on, and season with salt and pepper. 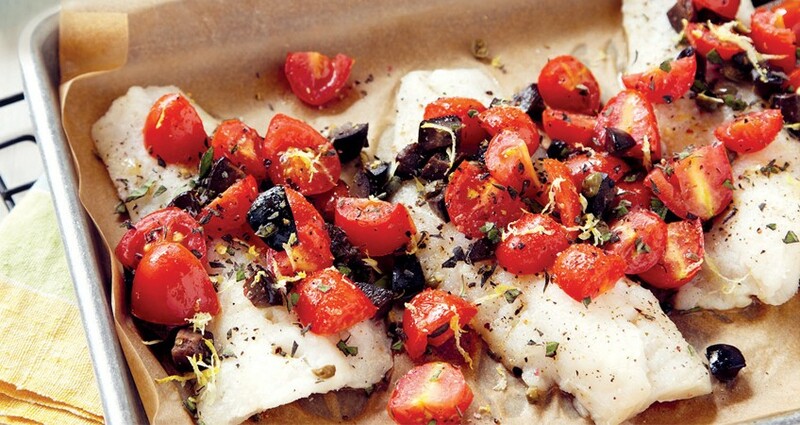 Heat the olive oil in a large pan and cook the fillets skin side down for 2-3 minutes until just crisp. Transfer to a large roasting tin, skin side down. Cut the cherry tomatoes in half and scatter around the fillets. Cut the Kalamata olives in half and scatter over the tomatoes, followed by the pine nuts. Season. Put the tray in the oven and bake for 12-15 minutes, until the fish is tender. Remove from the oven and scatter the tomatoes with the basil leaves. Spoon onto four warm plates and top each with fish. Drizzle with a little extra virgin olive oil.